Salut! 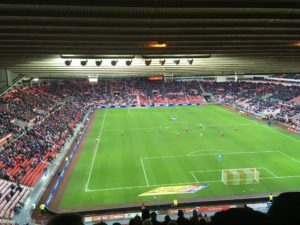 Sunderland: Fulham are on song as I write but may yet have to settle for the playoffs. Is that enough or would failure to grab an automatic promotion place be a serious disappointment? Joe Jenkins: not a serious blow. Really. We have had a magnificent run but remember we are talking about Fulham. We have a word for it: “Fulhamish”. It has come to mean we do things in our own, often self-defeating way. We hit blinding form in the second half of last season too and then lost in the play offs against Reading, who had worked us out brilliantly at the last minute. We go through spells of playing particularly attractive and/or effective football and then blow it: the Europa League final in 2010 against Atletico Madrid is a classic example – but what an achievement to get there. Second place right now would be a bonus. The second half of the last two seasons should in theory add up to promotion but… And who better to face, potentially, in the play offs but lovely Millwall, also in form and when it matters their support will be huge. So many people have said you are the best team, apart maybe from Wolves, in the Championship. Where are the weaknesses that have stood between that and sufficient consistency? We don’t perform well against London opposition, although the occasional result against Arsenal over the years – thank you Arsene – was always a delight. Tripping up against QPR and Brentford this season was entirely predictable. Nerves. We might not be quite as good as Wolves but we are arguably better than Cardiff now, just started our run a touch too late – maybe – to catch them. The truth is that until the second half of the season we lacked something. Jokanovic is a good manager, but it seems to take him a while to really get to grips with the best combination of players. Once he does though, he is responsible for some of the best football outside of the top flight. Would you want to keep Mitrovic if you made it up by whatever means this season? Yes. It was hilarious to hear other Championship fans moaning that we had him on loan. He has done a great job. The Premier League has moved on BIG TIME since we left it but yes I think he would be an obvious buy to get us going and it is clear from his body language that he fits in nicely to the squad and is loving Fulham. And how good a manager is Slavisa? Is he one to keep (in the sense that any club ‘keeps’ a manager for more than 10 minutes)? But whoever is in charge, could size of ground/resources mean Fulham would always be a struggling Premier League club? Yes, keep him for at least a season if he will stay. If we go up I believe we will stay up for at least two seasons. The manager isn’t really the issue. It is more the owner and his intentions. Shahid Khan is very keen on “sustainability”. He is pressing ahead with plans to redevelop the Cottage and add a few thousand more seats. But unless there is a huge investment in the squad we won’t make it past a couple of seasons, or will be lucky to. Jokanovic is prone to flounce. He appears to have been close to it already but is now getting his own way with recruitment. I hope he stays and makes a success of it. He deserves some Premier League success after his departure from Watford when he took them up. What do you make of our decline? Did you see it coming and what is our short, media-term future assuming we go down as is almost but not quite certain? I think you will come straight up – and I’m writing this just after you went down. Sunderland is a mighty club and has so much to be proud of and is a focal point for the whole community. Look, when we played you last we had an off day but you were able to capitalise on that when you were not in a great place yourselves, so there has to be hope there for next season. It is tough but you will be back soon, without a doubt. I don’t know enough about the inner machinations of the club to comment with any certainty, but my gut says your long-term future is sunnier than you’ll be feeling right now. 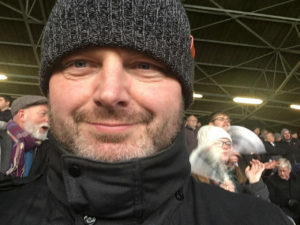 You’ve made at least two trips to the Stadium of Light – this season and also, if I recall correctly, that game when snow stopped play (you were leading and by the time the game was re-arranged we were already dwell and truly down, but somehow recorded our only home win of the season). What thoughts on SAFC, the fans, the region and, of course, your former player Chris Coleman? Okay, this is – my brothers and friends look away now – where I recount the dullest anecdote about an away day. Yes, it was the “famous” match in 2006 when it was snowing and Brian McBride scored the first goal only for the referee, Mike Riley, to abandon the match on 21 minutes. We lost the replay, I think. Very Fulhamish. Hugh Grant was there. I haven’t seen him since but then I don’t think I have ever seen one of our other celebrity fans, Richard Osman – but I think he only started going about five years ago. Anyway, I walked with some friends from the Metro to the ground and then realised I had lost my ticket. So we retraced our steps and as if by magic I spotted it in the snow on a nearby road. Said it was dull. But at least I got in for the match. For 21 minutes. We watched the Grand National in a pub and had fish and chips so the day wasn’t a complete write off. I’m very fond of visiting Sunderland and haven’t done it enough. 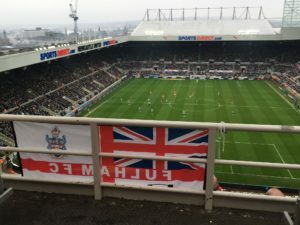 I have friends in Newcastle so we try to make a weekend of it when we can and I loved the Fulham 3-1 at St James’ Park last season. It was a special performance against the top club at the time. You might not be so happy about him, but Chris Coleman is a good guy. He took Fulham on in the Premier League, going from fancy Dan defender in the lower leagues with us, all the way to managing at the top and having his players poached (Saha to Man United, for instance). So he has backbone and history and understands good football. It might just have been too much of an ask this season for him. Inadvertently he kickstarted our run by beating Fulham in December, so he did us both a favour at the time. I bet Danny Murphy will be up there somewhere, but tell us which players have given you most pleasure in Fulham’s white which, including Johnny Haynes I imagine, you wish you had been around to see? Danny was a great figure in our later Premier League years. I once saw him control a ball at the Emirates and put someone through to score and it was the sort of move that South American commentators would wet themselves about. Sadly I am too young to have seen Haynes, Allan Mullery or any of that era. My older brothers made me learn by rote the Fulham team of the mid 1970s when I was about three, so players like Viv Busby trip off the tongue. And sadly I missed Rodney Marsh, George Best and Bobby Moore, but Peter Mellor, the losing goalie in the ’75 FA Cup Final against West Ham, gave me a Fulham scarf at my first ever Craven Cottage appearance, when my brothers took me to a reserve game around ’76. As a kid I loved Paul Parker, Gordon “Ivor” Davies, Leroy Rosenior, Kenny Achampong. In more recent decades Simon Morgan, Lee Clark, Rufus Brevett, Barry Hayles, Louis Saha, Luis Boa Morte, Edwin van der Sar and then the kids like Patrick Roberts and Ryan Sessegnon. We’ve been blessed with some special players over the years, even if in most cases they were cameos, like Best. Berbatov divides opinion because he was a disruptive influence at times but what feet… but Vincenzo Montella, Peter Beardsley (sorry) and ex-Galactico Mahamadou Diarra to name three – of many – more. It has been a ride and rarely dull since some lean times in the last 80s and early 90s. Beyond Coleman, the names linked to both clubs include Steed, Lee Clark, Kevin Ball, Vic Halom, Clive Walker, Kieran Richardson,Dickson Etuhu, Andy Melville, Who stands out for the right or wrong reasons? Steed was special and much admired. I named a cactus after Lee Clark. I liked Dickson and Melville but I will always remember writing my one and only bit of schoolboy fan mail to Clive Walker in the ‘80s. He had a particular knack for crossing very accurately from the goal line after spectacular dribbles down the wing and I told him so. He didn’t reply. The Dele Alli question: is diving really as trivial a matter as Pochettino claims, should England fans welcome a World Cup win it depended on one of his more successful dives or is it cheating our and simple, to be eradicated from the game? I’ll be honest: I have hardly watched the Premier League since Fulham went down. I don’t actually care about it at a personal level. All I will say is that I went to Arsenal against Man Utd this season and was actually astonished by the style of diving. In a few years it has really moved on from where Fulham left off. I was quite shocked by how blatant and pathetic it was. The Prem = Serie A and worst leagues for cheating. But if that’s the modern game, we have to get used to it. Otherwise we’ll just be disappointed – as usual – when we (England, I mean) are cheated against at the World Cup and go home early – as usual. How do you follow games from Abu Dhabi ( we were in the Premier when I lived there so I was able to see more games than at any time since I was a teenager back in the North East)? 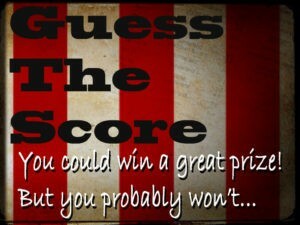 What will be the score in this one? I’ll be honest, I haven’t worked that out yet. I follow the BBC updates. I’m too busy deciding what furniture to buy. 3-2 to us. * Joe on Joe: I was scarred, aged three, from being left with a child minder rather than my family taking me to the 1975 FA Cup Final to get used to seeing Fulham lose (0-2 to West Ham). I’ve since followed Fulham, mostly at home but with some notable away days, seriously since my early teens. I’ve become more fairweather in recent years (relegation was a blow, as you will appreciate). I have recently moved from London to Abu Dhabi (even fairer weather), where I am a journalist. One day I will work out how to watch us over here. We have our own top flight clubs but all eyes here are on Man City.